Smart phones with Internet capability are growing in popularity, due to many of their useful capabilities. Among other handy features of smart phones, Instant Messaging (IM) is very popular due to the level of convenience it provides in interpersonal communications. As the usage of IM on smart phone is increasing rapidly, it is important to take measures in advance from forensic standpoint forecasting the potential use of it in cyber crimes such as the cyber stalking and cyber bullying. Although, current IM applications for smart phones are in most cases a downsized version of the one used on traditional computers, diverse structure of file systems and storage device on different smart phones pose unique challenges to forensic examiners for recovering digital evidences of a conversation under investigation. In this work, we study and report the forensic analysis of three different IMs: AIM, Yahoo! Messenger and Google Talk, (both client based and web based version) on Apple iPhone. 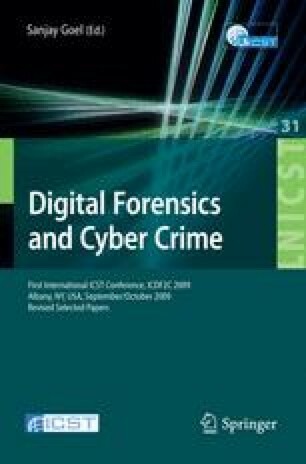 Our results show that the forensic analysis of IMs on smart phones has significant value and needs further attention.